My hope with this article is to provide some insight into learning to hunt deer from someone who didn't grow up hunting. I am an outsider to the sport and very much tried to ask (and answer) the dumb questions so you don't have to. Learning a new sport or hobby can be intimidating, especially when people use jargon you don't understand and don't always explain what they are talking about, because everyone else already knows. 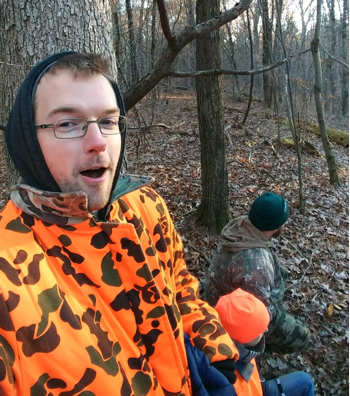 This article is about my first impressions and what I learned on my first hunting trip. When drawing a crossbow, the bow must be set in the "fire" position (the safety-off). As you draw the bow up, it will lock the string into place and set it into "safe" mode. If the bow is in "safe" mode when you draw the crossbow, you will hear the string lock into place however it will be locked lower than required and will not fire. You will load the arrow, put the crossbow in "fire" mode and be unable to pull the trigger. To fix this, remove the arrow. Set the bow to "fire" mode, draw the string back higher, where it will lock into position in it's proper position. Like everything else, how did we learn this? We drew the crossbow, set the arrow, I lined up my shot and squeezed the trigger. I first thought it was not like a gun trigger and required a bit more force, I squeezed harder, thinking I was a weakling. Nope, the crossbow was locked. 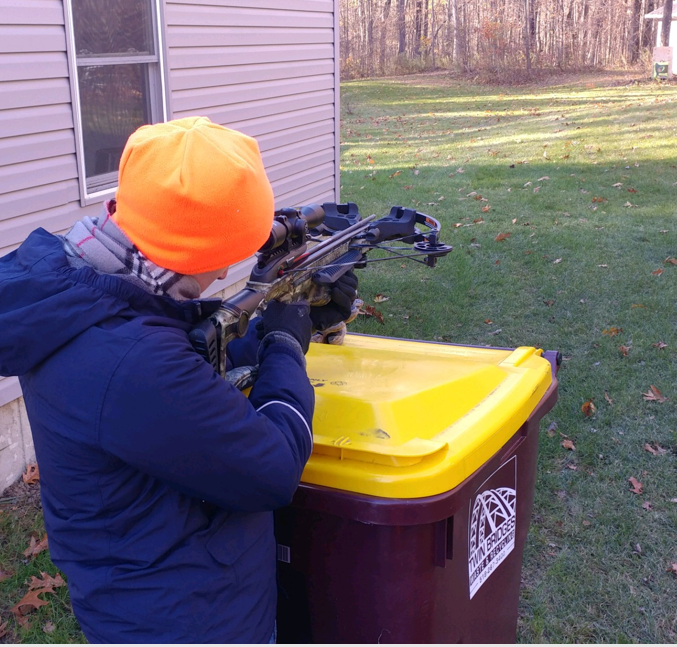 Luckily we learned this while practicing with the crossbow in the backyard, and not while staring at a live deer. 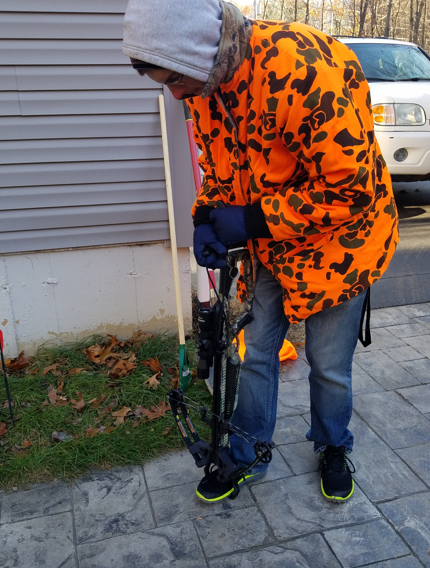 We were hunting with the Barnett Whitetail Hunter Crossbow. Camouflage is mostly just for show. In fact, deer are color blind which is why the hunter orange works great at preventing other hunters from accidentally shooting each other. The deer can't see orange from green or brown. The camo however is good for the pattern, and blending in rather than being a solid mono-tone color. 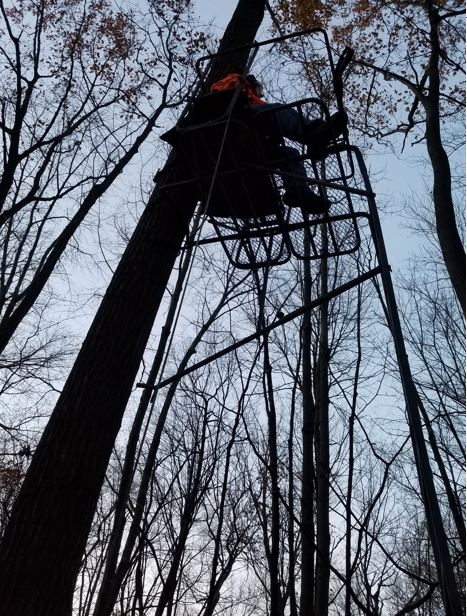 However if you are in a tree-stand it doesn't really matter what you are wearing. I will admit when seeing hunters, I was intimated by their large guns and head-to-toe camo. So it's good to know, you don't need military style camo to hunt. The number of points of a buck (8-point buck) is the physical count of the points on it's antlers. This may seem super obvious to those who live close to life-long hunters, but ask any city folk what 8-point buck means and they may attribute it to something like a 25k carat diamond, means it is a big deer but don't have a sense of what it exactly means. The number of points is related to genetics, how much food the deer found and how big it is, not a direct count of how old the deer is. Hunting, by that I mean sitting in one spot waiting for a long while, can get mighty cold! Wear layers, bring gloves, scarves, hand warmers, etc. Don't forget warm boots and your hunter orange vest over top. Whitetail deer are creatures of habit, they will walk the same trail even if they got shot at yesterday. We saw a 6-point buck but missed the shot. Afterwards we talked to our guide's father who said he also took a shot at the same deer a few days ago. Near-death experiences don't seem to change a deer's habits. Deer will sometimes bed down in leaves or bushes during the day. Walking around the woods can spook from from their spot, where you might have a chance to hunt them. While deer typically are most active at dawn and dusk, you can sometimes spot them grazing during the day. Very often if you see a doe and her fawn there will a buck on her trail, looking for a mate. Since she already has a kid, she puts off pheromones that tell the buck she is more apt to mating. So if you see the doe/dawn pair, wait for the buck. If you want the deer to look at you, to line up a shot better make cooing or clucking noises at it. Just like you would cluck at a horse or coo at a baby to get their attention, it works the same with the deer. They may take a step out from behind a tree, so you can line up your shot. Sitting in the woods quietly, listening to the birds and squirrels while watching for any movement is quite relaxing. Until a deer walks by, then the adrenaline starts pumping. Unfortunately I did not have the opportunity to take down a deer on this hunt, but I am thankful for the opportunity to start to learn to hunt whitetail deer. Many thanks to our friend Doyle for taking us out on his land, letting us use his equipment, and for teaching us a thing or ten about hunting. Share you first hunting trip story in the comments below. Just as we back up our computers to prevent against loss, we also should back-up our physical supplies. I back up my computer to a separate hard drive plus there are numerous cloud storage options. When it comes to physical supplies, we also should have a off-site back-up plan in place. Storing vital survival and comfort supplies are someone's house or a separate location will give you greater protection against loss. Reason #1: One is None. Two is One. This old saying applies to the physical location of our supplies as well. Storing all your preps in your home creates a weak point if you home is destroyed or compromised. A second storage locations adds redundancy to your plans. When you ask a friend or family member to host your off-site kit it opens the conversation for the need to prepare for small scale and large scale emergencies. In return you could offer to help them put together a kit to keep in your home. At Modern Self-Reliance we believe that every person who is more prepared makes the whole community stronger. Reason #3: Piece of Mind. 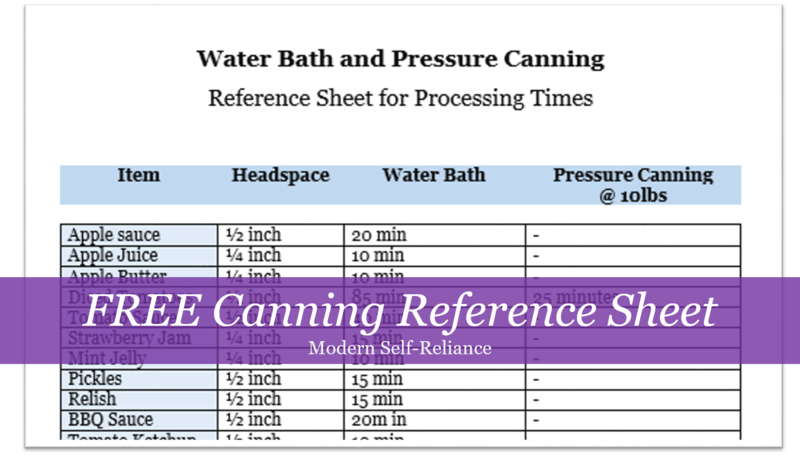 Each component of your supplies should give you piece of mind that you have one more resource if needed. 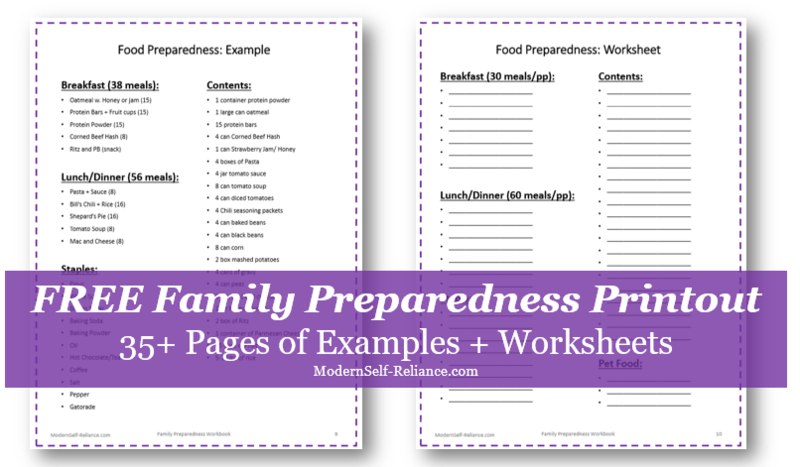 I feel that being prepared is not about being afraid of disaster but rather planning for, and knowing if something happens you have a plan and basic supplies. Do you have a secondary storage place for some essentials? What do you keep in it? Let us know in the comments below. 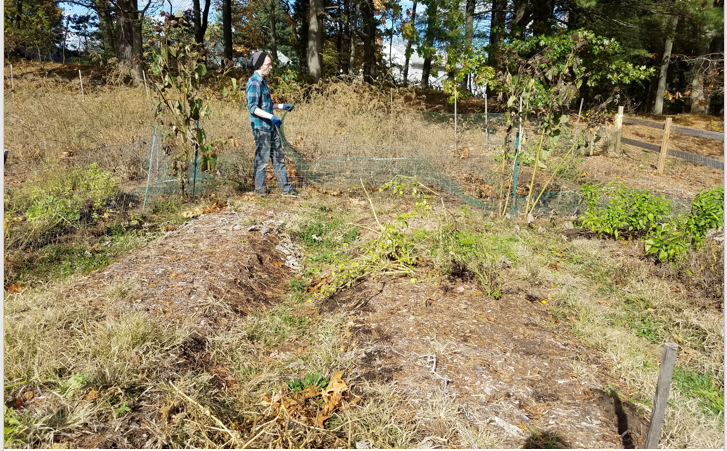 This year we have 600 sqft of growing space at our local community garden. 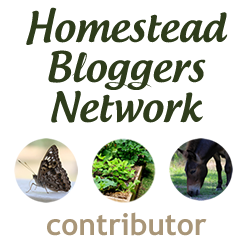 When I was first starting to garden, I wondered what are typical yields of a home gardener? Not yields for an experience commercial farmer with tons of pesticides, but the common man's yields. Zucchini and peppers did terribly! They died early or were slow to grow and produce. Not a great year for them. Tomatillos did amazing! Having never grown these before, I didn't know what to expect. They grew well without support, and were a solid producer over the season. Long Island Cheese Heirloom Pumpkins are amazing. Smaller and creamy colored pumpkins, these did great despite some squash bugs and powdery mildew. Mustard greens, carrots, peas, bush beans, tomatoes were all solid producers I could count on, without too much weeding effort or pests. Boston Marrow squashes were ok. Some rotted before ripening, but I got one good one. Acorn and butternuts did well considering hard squashes aren't my strong point. But they grew the best I have ever grown them, which isn't saying much. Onions. This was my first year growing onions (from seed no less) and they did fairly well. I am proud of my meager harvest, and will plant way more next year. So what did I do with all this produce? First off, we ate some of it fresh and delicious from the garden. I froze the green peppers, jalapenos, grated zucchini/yellow squash, and some green beans. The hard squashes and onions are sitting out. 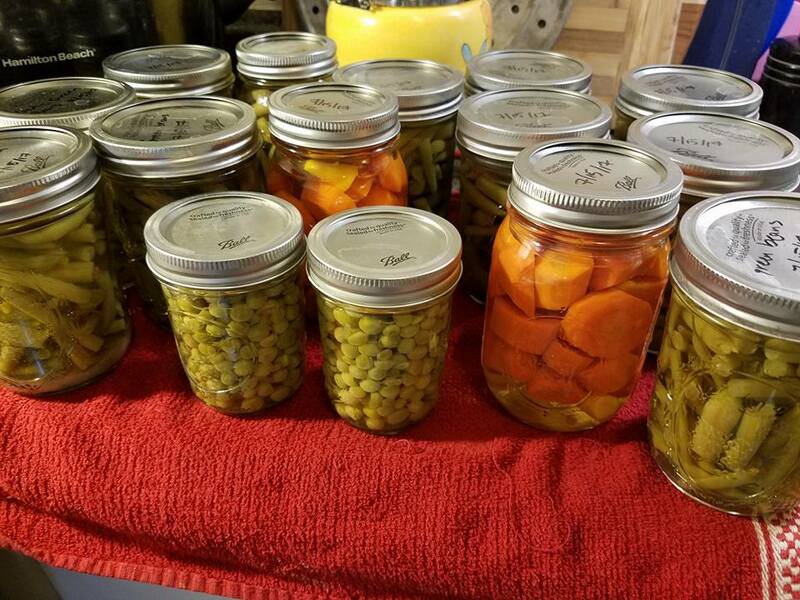 The tomatoes, green beans, carrots, and tomatillos were all canned. Tomatoes/Tomatillos: What I canned should last Tim and I the whole year, based on last year's consumption. Green beans/Peas: I was hoping for 26 pints of green beans and actually canned about half that. I was aiming for 26 half pints of peas, and got 5...so not even close. There is always next year. Made it to the bottom of this article? Thanks for sticking with me. I record these yields to help me plan for next year and understand my family's food needs. I hope they give you an example for what might work for your family. 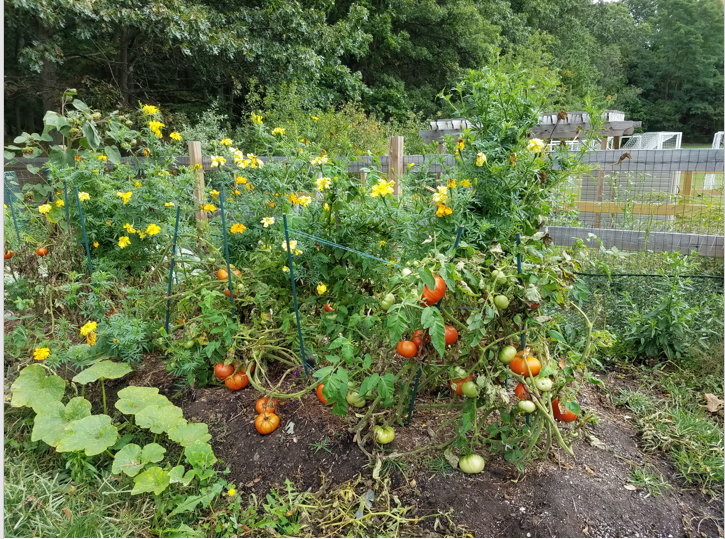 How did your garden turn out this summer? Let us know in the comments below.